Photo: Sophie Donald. Creative Commons BY-NC-SA (cropped). Researchers have taken a cue from marine mussels to create a flame retardant that is nontoxic and won’t accumulate over time in the environment and living animals. Flame retardants are added to foams found in mattresses, sofas, car upholstery, and many other consumer products. Once incorporated into foam, the chemicals can migrate out of the products over time, releasing toxic substances into the air and environment. Throughout the United States, there is pressure on state legislatures to ban flame retardants, especially those containing brominated compounds (BRFs), a mix of human-made chemicals thought to pose a risk to public health. Researchers discovered that a synthetic coating of polydopamine — derived from the natural compound dopamine — can be used as a highly effective, water-applied flame retardant for polyurethane foam. Dopamine is a chemical compound found in humans and animals that helps in the transmission of signals in the brain and other vital areas. The researchers believe their dopamine-based nanocoating could be used in lieu of conventional flame retardants. “Since polydopamine is natural and already present in animals, this question of toxicity immediately goes away,” says Christopher Ellison, associate professor in the Cockrell School of Engineering at the University of Texas at Austin. For the study, published in the journal Chemistry of Materials, researchers used far less polydopamine by weight than typical of conventional flame retardant additives and discovered that the polydopamine coating on foams leads to a 67 percent reduction in peak heat release rate, a measure of fire intensity and imminent danger to building occupants or firefighters. To the researchers’ surprise, they didn’t even have to change the structure of the polydopamine from its natural form to use it as a flame retardant. The polydopamine flame retardant’s ability to reduce the fire’s intensity is about 20 percent better than existing flame retardants commonly used today. Researchers have studied the use of synthetic polydopamaine for a number of health-related applications, including cancer drug delivery and implantable biomedical devices. However, the new study is thought to be one of the first to investigate the use of polydopamine as a flame retardant. To the researchers’ surprise, they didn’t even have to change the structure of the polydopamine from its natural form to use it as a flame retardant. The polydopamine was coated onto the interior and exterior surfaces of the polyurethane foam by simply dipping it into a water solution of dopamine for several days. The researchers were drawn to the compound by its ability to stick to surfaces — as demonstrated by marine mussels who use it to stick to virtually any surface, including Teflon, the material used in nonstick cookware. Polydopamine also contains a dihydroxy-ring structure linked with an amine group that can be used to scavenge or remove free radicals. Free radicals are produced during the fire cycle as a polymer degrades, and their removal is critical to stopping the fire from continuing to spread. The compound also produces char, a protective coating which blocks fire’s access to its fuel source — the polymer. The researchers are now testing to see whether they can shorten the nanocoating treatment process or develop a more convenient application process. 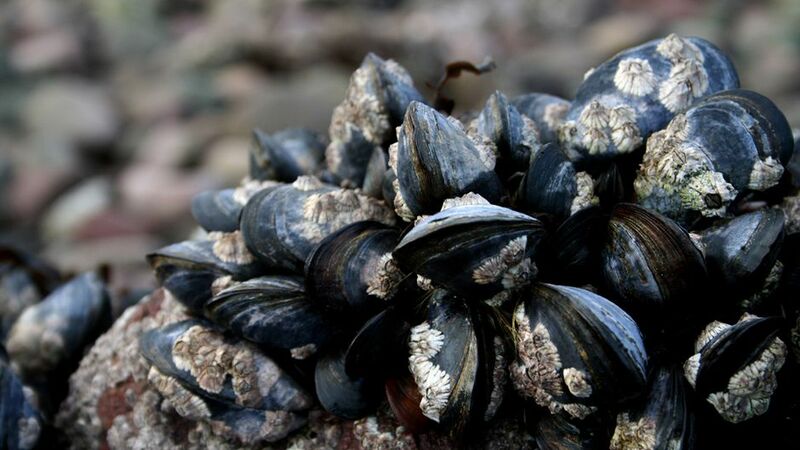 Biomimicry Advance: Mussels Inspire Nontoxic Flame Retardant by Sandra Zaragoza is licensed under a Creative Commons Attribution-NonCommercial-ShareAlike 4.0 International License. Based on a work at Futurity. Sandra Zaragoza is a writer and media relations manager at the University of Texas at Austin’s Cockrell School of Engineering.